Prepare baking dish with cooking spray and a light flour dusting. In a large mixing bowl whisk together the milk, egg and vanilla until well blended. Gradually fold the dry ingredients into the wet ingredients JUST until combined. DO NOT OVER MIX! In a medium bowl sift together the dry ingredients. Pour melted butter over dry ingredients and stir gently until crumbs form. Sprinkle the crumbs over the batter. Use a knife to swirl some of the crumb mixture down into the cake. Bake 25-30 minutes or until toothpick comes out clean. 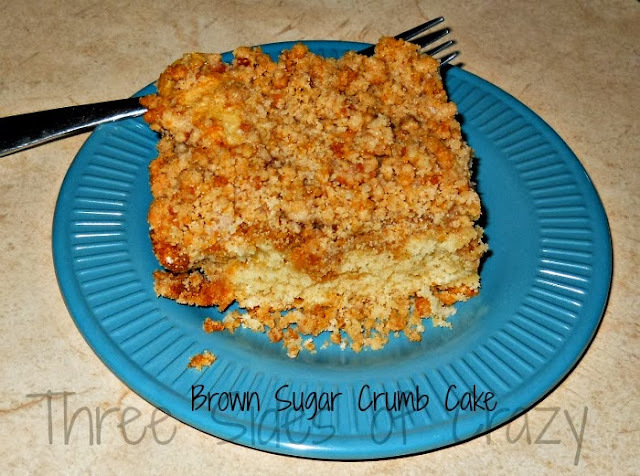 **With the move coming up I'm not replacing food and I was OUT of brown sugar! Then I remembered I had cut out an article on making your own brown sugar. I have to say that in the future I may always make my own brown sugar - the flavor was so deep and rich. Combine together in a large mixing bowl starting with a low speed and gradually increasing until well blended. This can take as long as 10 minutes.